Food Plant: Circaea lutetiana (Enchanter's Nightshade), Epilobium hirsutum (Great Willowherb), Epilobium montanum (Broad-leaved willowherb). 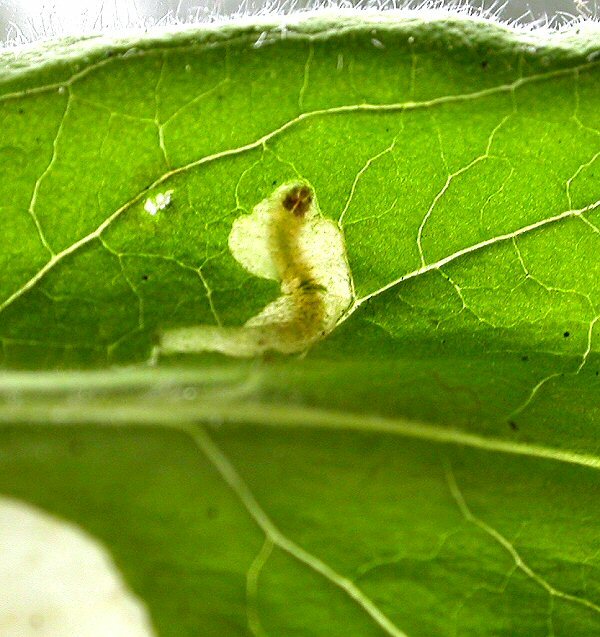 Pupa: Occasionally in a mined leaf or in a cocoon between the leaves or on the leaves. Notes: A narrow contorted gallery leading to a whitish blotch with scattered frass centrally. The early gallery can merge with the blotch and there are often several to a leaf. The larva (illustrated) is light yellow, with darker thoracic legs. Note the dark brown prothoracic markings, with a median sulcus.